We have won the Fight for Life and the Future of our Children! Different groups of concerned citizens attended the signing of the agreement on August 27 to close the electronic horse racing gambling center. The placards generally say "We won!" The agreement was reached after 1579 days of protest, which included 1314 days of 24-hour sit-in rally. 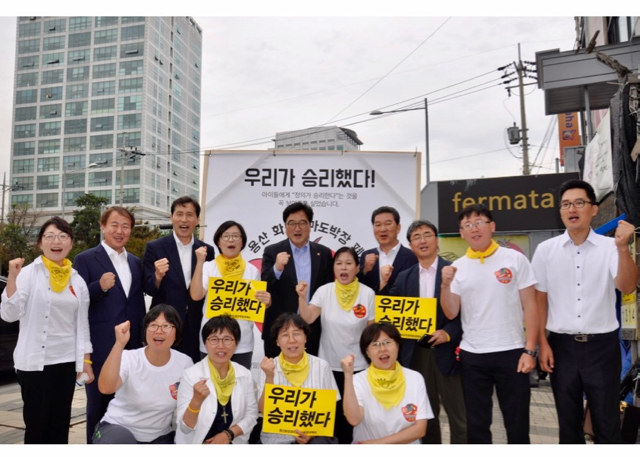 RSCJs campaigning for a vote "to repeal the gambling center"; a vote for "a village without a gambling center"
School teachers and concerned citizens with placards saying "We won!" Sister Kim Yul Ok rscj with local representatives of Yongsan and of the Korean Horse Racing Association. Photo taken on August 27, after the signing of the agreement. On the 27th of August, the agreement was signed between the Local Representatives of Yongsan (Seoul), one of whom is Kim Yul-Ok rscj, and the Korean Horse Racing Association, stating that the Electronic Horse Racing facility in Yongsan will close and move out by the end of December 2017. 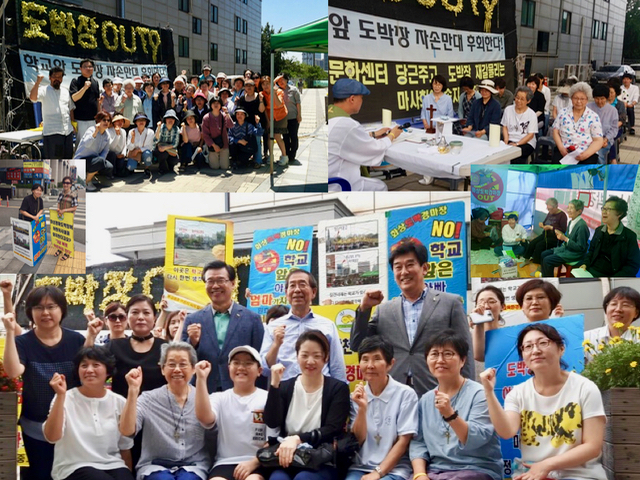 For almost five years now, more precisely for more than 1500 days, members of the Sacred Heart School in Yongsan (RSCJ, teachers, parents and students), the local community, and NGOs have been protesting against the electronic horse racing facility, which was put up near the school. Click here to read the article published on rscjinternational in July 2014. The decision of the government to have this gambling facility closed by the end of this year is welcomed by people with delight. With joy, we now want to share with you how we walked this journey. At the end of April of 2013, three members of the Yongsan-Gu Local Government visited our school and informed us that an Electronic Horse Racing (EHR) facility was to be opened near our school. Realizing the urgency of the situation, and motivated by our desire to protect the health and security of our educational environment, our school community and the local community immediately formed the “Task Force against Electronic Horse Racing”. Thus began our protest action which was like the fight between David and Goliath. Believing and trusting that ‘The Lord will not save us with a sword nor a spear… [and] that the battle will depend on God’ (1 Samuel 17, 47), we prepared ourselves for what we knew would be a long struggle. We were small and weak; but, as adults, teachers, and parents who have the duty to protect our children, we were committed to keep up the fight. A few photos taken at different times during the 1500-day protest. One of the protest activities was to have a tent for a sit-in rally that was assembled right beside the gambling facility. We began doing this in January 2014, in the midst of harsh winter weather. To our amazement, residents, teachers, RSCJ, alumni, parents of our students voluntarily signed up to join these sit-in rallies, which we were able to run for 24 hours and sustain until now. A liturgical celebration held at the sit-in rally on April 30, 2015. Over these last few years, we have had a series of unfortunate events involving young people in educational endeavors (the sinking of the Sewol Ferry, deaths related to Middle East Respiratory Syndrome - MERS, and the humidifier germicide which likewise resulted in deaths). We called on our government to remember that it is our responsibility to care for our children and youth. We have to ensure that they, who are the future of our nation, have a safe and healthy educational environment. Our cry has been heard! The EHR facility will be closed by December 2017.
and other concerned citizens and local officials. We remember with gratitude the contribution of each and every one who participated in this 1500-day protest. Thank you to the members of the school (parents, teachers, students, alumni) and local communities, the NGOs, the residents, and all concerned citizens! Thank you to the KOC Province for the support, and particularly to each RSCJ who helped us sustain this protest. and concerned citizens, engaging in different protest activities. Above all, we thank God who has accompanied us in this journey. This time of protest enabled us to grow as ‘Women of Life’ committed to protecting life, and as ‘Women of Reconciliation’ who are in solidarity with many others who are suffering. For all this, we give praise and glory to the God of Life!